The TOEFL Test is a test to measure the English proficiency of nonnative speakers of English. It is required primarily by English language college and universities. Additionally, institutions such as government agencies, businesses, or scholarship programs may require this test. The TOEFL test currently exists in paper, computer and internet formats. 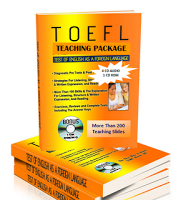 The Purpose of this book is to prepare students for the paper version of the TOEFL test. Listening Comprehension: To demonstrate their ability to understand spoken English, examines must listen to various types of passages on a recording and respond to multiply choice questions about passages. Structure and Written Expression: To demonstrate their abilities to recognize grammatically correct English, examinees must either choose the correct answer way to complete sentences or find errors in sentences. Reading Comprehension: To demonstrate their ability to understand written English, examinees must answer multiply choice questions about the ideas and the meanings of words in reading passages. The probable format of a paper TOEFL test is outlined below.